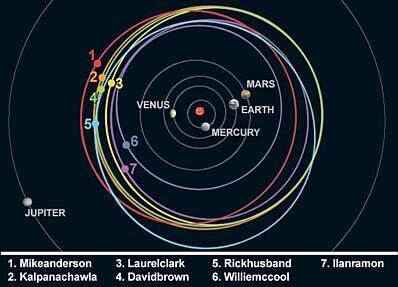 The final crew of the Space Shuttle Columbia was memorialized in the cosmos as seven asteroids orbiting the sun between Mars and Jupiter were named in their honor today. The Space Shuttle Columbia crew, Commander Rick Husband; pilot William McCool; Mission Specialists Michael Anderson, Kalpana Chawla, David Brown, Laurel Clark; and Israeli payload specialist Ilan Ramon, will have celestial memorials, easily found from Earth. The names, proposed by NASA's Jet Propulsion Laboratory (JPL), Pasadena, Calif., were recently approved by the International Astronomical Union. The official clearinghouse of asteroid data, the Smithsonian Astrophysical Observatory's Minor Planet Center, released the dedication today. The seven asteroids were discovered at the Palomar Observatory near San Diego on the nights of July 19-21, 2001, by former JPL astronomer Eleanor F. Helin. She retired in July 2002. The seven asteroids range in diameter from five to seven kilometers (3.1 to 4.3 miles). The Palomar Observatory is owned and operated by the California Institute of Technology, Pasadena. "Asteroids have been around for billions of years and will remain for billions more," said Dr. Raymond Bambery, Principal Investigator of JPL's Near-Earth Asteroid Tracking Project. "I like to think that in the years, decades and millennia ahead people will look to the heavens, locate these seven celestial sentinels and remember the sacrifice made by the Columbia astronauts," he said. The 28th and final flight of Columbia (STS-107) was a 16-day mission dedicated to research in physical, life and space sciences. The seven astronauts aboard Columbia worked 24 hours a day, in two alternating shifts, successfully conducting approximately 80 separate experiments. On February 1, 2003, the Columbia and its crew were lost over the western United States during the spacecraft's re-entry into Earth's atmosphere. Asteroids are rocky fragments left over from the formation of the solar system about 4.6 billion years ago. Most of the known asteroids orbit the sun in a belt between Mars and Jupiter. Scientists think there are probably millions of asteroids, ranging in size from less than one kilometer (.62 mile) wide to hundreds of kilometers across. More than 100,000 asteroids have been detected since the first was discovered back on January 1, 1801. Ceres, the first asteroid discovered, is also the largest at about 933 kilometers (580 miles) in diameter. The Near-Earth Asteroid Tracking System is managed by JPL for NASA's Office of Space Science, Washington. JPL is a division of the California Institute of Technology, Pasadena. SIGNED COPIES! "A Space Story" DVD is a galactic journey with astronaut Story Musgrave visiting the Hubble Space Telescope, viewing Earth from Space, and reaching for the heavens. Get a signed copy while stocks last! This three-disc DVD contains rare footage from the pioneering Gemini space missions of the 1960s. Now shipping from the Astronomy Now Store. 80 minutes of spectacular digital video of planet Earth beamed down from the shuttle accompanied by instrumental music, plus a 4-minute shuttle liftoff guaranteed to rock your living room.